One of the mainstays of psychotherapy is the idea that talking about your emotions—or even writing about them—can help you to regulate them. Mindfulness-based approaches from Buddhism offer similar outcomes—the idea is that if you are “mindful,” or aware, of your feelings, then they won’t seem as strong. Until recently, it was not well understood how, or even why, labeling your feelings worked to reduce them. In some ways, it seems too simple to be true. Yet growing evidence from neuroscience suggests that labeling your feelings is in fact a good idea; telling your kids (or your spouse) to “use their words” when they’re upset just might work. In a recent paper from my lab, my collaborators and I explored the neural mechanisms at play when people are prompted to label their emotions versus when they are not prompted to label their emotions. This paper was particularly powerful because it used meta-analysis to summarize the findings across 386 neuroimaging studies of emotion (for more on the neuroimaging of emotion, see our recent post). This means that we were able to say which brain regions were consistently more active across 386 studies when individuals were prompted to label their emotions versus were not prompted to label their emotions. In many cases, participants had no clue that labeling would have an effect on their emotions. 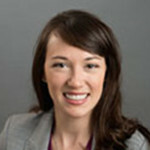 In fact, most studies were not explicitly designed to even test this hypothesis, they just conveniently asked participants to label their feelings as part of their study design (to check that participants were in fact experiencing the desired emotions, to ensure that participants were paying attention, etc.). Thus, our paper offers a unique lens for examining whether drawing people’s attention to emotion labels alters their brain activity while they are experiencing emotions. In contrast, when emotion words were not present in experiments and participants were just experiencing emotions unfettered, we found greater activity in the amygdala. The amygdala is well-known to show increased activation during emotions and may be particularly involved in intense or impactful experiences. We also know that the amygdala has increased activation to ambiguous stimuli and situations. Together, these findings suggest that when you’re not prompted to access emotion words prior to viewing a negative image, your feelings may be more intense and harder for you to understand. Consistent with this interpretation, other classic findings on emotion labeling demonstrate an interplay between prefrontal regions involved in representing words and the amygdala–greater increases in word-related regions result in greater decreases in the amygdala during emotional experiences. Taken together, our findings begin to shine light on the neural basis of why putting feelings into words may work. Teaching people to become more mindful of their feelings, or to become better at labeling their feelings in nuanced ways (a facet of “emotionally intelligence”) may be a fruitful route for getting emotions under control. In fact, kids who “use their words” following emotional intelligence training do better at school and have more positive relationships with other kids and teachers. The next time you’re feeling bad, try labeling it. You might just feel better. 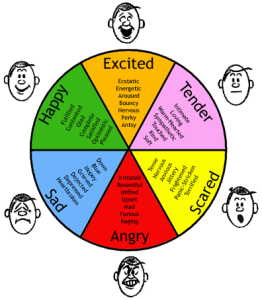 This post is the latest in our Introduction to the Neuroscience of Emotion series. It discusses research using healthy human subjects and functional magnetic resonance imaging (or fMRI for short) to understand the brain basis of emotions. In coming months, we’ll have posts about studying individuals and animals with brain lesions as well as other neuroscience tools. According to Aristotle, emotions come from your heart. In his view, the brain is just a pile of meat that is used to cool the blood. We’ve learned a thing or two about the structure and function of anatomy since the time of Aristotle; almost everyone today agrees that emotions—and mental life, more generally—originate in the brain. But, the question that remains for modern neuroscientists is how this happens. Philosopher David Chalmers calls this “the hard problem” for a reason – understanding how the brain creates conscious experiences such as emotions is extremely challenging. Despite how hard this problem is, we’ve learned a lot over the past several decades about how the brain creates the mind, and in particular, how the brain creates our emotions. One of the major focuses of my laboratory is to understand how emotions emerge from the complex firing of neurons across the brain. We typically study emotions in healthy adults, meaning that we’re interested in how emotions work when people are functioning optimally. Knowing how the brain creates emotions in healthy people helps scientists to begin to target what goes wrong when someone suffers from a mental disorder such as anxiety or depression. The majority of our research uses neuroimaging—or what is called functional magnetic resonance imaging (fMRI for short). We use the same MRI machine that your doctor uses when she examines a tear in your knee, although we put people in the scanner head-first to examine their brain activity. This feat is accomplished via a fortunate property of the blood—it has different magnetic properties when it is carrying oxygen to your neurons v. when the neurons have used up all its oxygen; changes in how much oxygen are present in brain tissue can be detected by the MRI machine. Since “active” neurons need more oxygen, we can identify regions that are relatively more active during one mental event (e.g., feeling excited about an upcoming party) v. another (e.g., feeling neutral about making dinner tonight). In our studies, we ask people to experience certain emotions by showing them evocative images (e.g., a picture of a striking snake), having them recall emotional events (e.g., the death of a loved one), or even putting them in emotional situations (e.g., telling them they need to give a speech that we will evaluate) and examine which brain regions are more “active.” Decades of research have now examined this question and have revealed some interesting and surprising findings. For a long time it was assumed that each emotion has its own neural real estate in the form of dedicated neural circuitry that is responsible for its creation. This can be seen in the belief that an emotion comes from certain brain area (e.g., the amygdala) or a network of areas in the evolutionarily “old” portion of the brain (e.g., a network in the brainstem and other regions below the evolutionarily “new” cortex). However, despite what many people (scientists and non-scientist alike) believe to be true, we do not find that there is one region or circuit for a given emotion (e.g., fear). One of our most comprehensive projects was a “meta-analysis” that summarized the findings of all of the existing fMRI studies to date. Our method was designed to reveal which brain regions were consistently active across different studies and types of emotion (anger, disgust, fear, happiness, sadness) and which brain regions were specifically active during certain emotions (anger v. disgust v. fear v. happiness v. sadness). 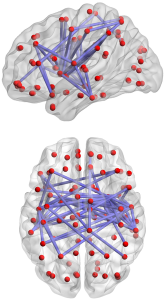 We found that much of the brain is consistently active when someone is “having an emotion”—not just the brainstem and subcortical regions (see figure above: regions in pink, orange and yellow represent regions that are consistently active across all studies of anger, disgust, fear, happiness and sadness). 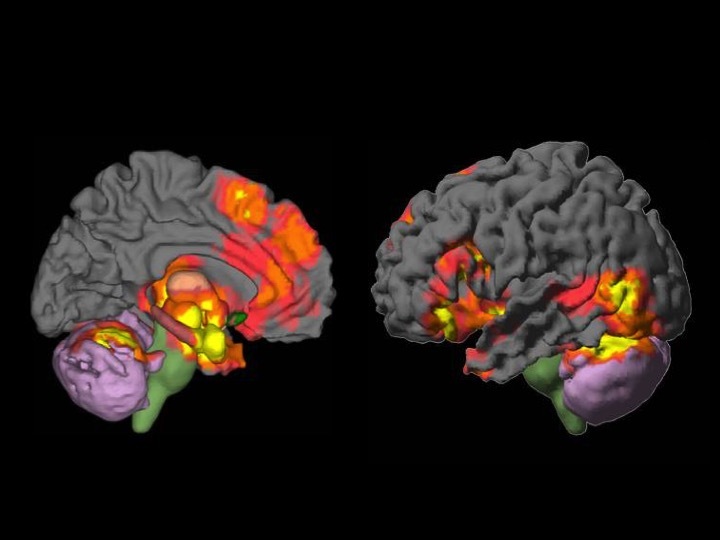 What was interesting about these consistently active regions was that they included brain areas that we know are involved in the types of “hot” body changes that accompany emotions (e.g., increases in heart rate, respiration, etc. ), but they also included regions associated with the type of “cool” so-called cognitive functions aren’t generally associated with emotions such as attention, memories, and language. Each type of brain region was involved in all the emotions studied. Moreover, not a single brain region in our analysis was specific to any given emotion. For instance, the amygdala was not the brain basis of fear as is typically assumed (for another recent discussion from renowned neuroscientist Joe LeDoux see here). Instead, the amygdala was active across every type of emotion experience we looked at in our analysis (including fear but also anger, disgust, sadness, and happiness). 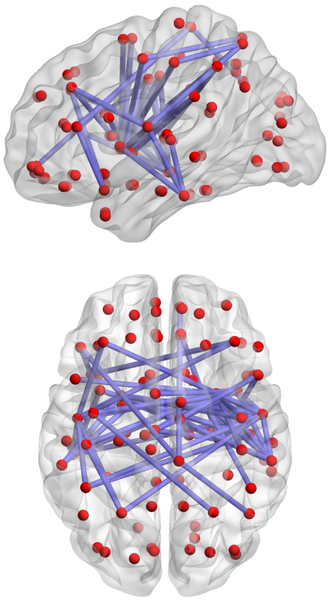 My latest research demonstrates that these brain regions are not just acting alone, but in concert with one another as parts of complex networks (see figure to the left for an image of what brain networks might look like–dots represent regions in the brain and lines represent connections between different regions). Take a minute and think about your social networks—you are probably part of several different social networks consisting of people who are connected by some function: you might have your work network, your family network, your neighborhood network, your exercise network, your school network, etc. Brain networks are just like this, except they are groups of brain regions working together to serve some function. An emerging idea in neuroscience is that these groups of brain networks—what we call functional networks—are kind of like the basic “ingredients” of the brain. Just like ingredients in your pantry, they combine together to produce more complex products. Just as oil, flour, baking soda, and water can be combined to make cookies, pancakes, breads, etc. different brain networks supporting basic functions combine to create emotions, thoughts, perceptions, and all the mental stuff we experience on a day to day basis. We are finding that the particular combination of these network-based “ingredients” differs when you’re experiencing anger v. fear (see here), and even when you’re experiencing a thought v. an emotion (see here). What’s compelling about these findings is that it appears that your emotions, and all your mental states for that matter, are created out of the same basic “ingredients” of the mind (for a more in-depth discussion, see here). These ingredients probably serve very basic functions such as activating your body for engaging in actions, representing your body changes as feelings, representing your past experiences in order to make meaning of the present, processing visual and auditory information from the world, and directing your attention to changes outside in the world or inside your body. The idea that your mental states are the complex products of basic “ingredients” is fundamentally different from the idea that each brain region serves its own special function for its own specific mental state. This new view also begins to chart a different path forward for understanding mental illness—a person with anxiety might not have something amiss with their “fear center,” but might instead have something wrong with a system that activates the body or a system that shifts attention (or both). We’re still just scratching the surface of how your brain creates emotions and fMRI offers only a single lens, but it’s already telling us important new things about how our brain creates our mental lives.